It was more than a dream come true for teenagers Lizzie Bravo and Gayleen Pease. 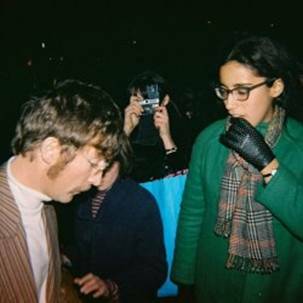 They were avid Beatles fans–so-called Apple Scruffs–who regularly hung around the entrance to EMI’s Abbey Road Studios, hoping for an encounter with their heroes. The Fab Four had graciously given the two girls autographs and posed for photos with them. But when Paul McCartney came out on this day and asked if they “could hold a high note,” little did Bravo (16) and Pease (17) expect the adventure to follow. Inside, the Fab Four had convened to record a single to release while they were on their upcoming sojourn to India with the Maharishi Mahesh Yogi starting later that month. On February 4, 1968, they were recording a song written by Lennon titled “Across The Universe,” and wanted to add high harmonies to its chorus. As no female backup singers were readily on call, the group decided to wing it and see if maybe the girls out front could sing the parts. After answering McCartney’s question that yes, they could hit and hold high notes, the girls were ushered into the studio by the band’s assistant, Mal Evans. “They started showing us the song and the lyrics. We were there for over two hours,” Bravo recalls. “We laughed and drank tea,” is how Bravo describes the atmosphere for the two hours that she and Pease were inside the studio. They sang that song’s chorus “Nothing’s gonna change my world” a number of times. The girls’ contribution was included in the song’s original release in December 1969 on the album, No One’s Gonna Change Our World, a benefit disc for the World Wildlife Fund organized by comedian Spike Milligan (who was a performer and writer with BBC’s The Goon Show, whose influence on the humor of The Beatles and their peers was iconic). It was later reissued on the British and American versions of Rarities and the second disc of the two-CD Past Masters album. A version without the girls’ vocals was included on Let It Be when it was issued in 1970. The video linked doesn’t contain the vocals. It’s just a horrid cover.